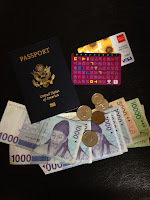 (Blog posted by Abby) I've been in Seoul for 6 days and I will be leaving tomorrow to fly back home to the States. Since I've now experienced it, I thought I'd give some information to those of you who plan on coming to visit Chelsea, or even those who may have stumbled on this blog and would like information about visiting your child or your friend who is Teaching English in Korea. I capitalized that because it deserves it. First of all, when traveling to South Korea, remember it is also called the Republic of Korea, and that is the same place. Yes, you'll need your passport! but no, you won't need a special visa of any kind if you are just visiting and being a tourist. If you are interested in coming to teach, live, work, in Korea, please see Chelsea's previous blog post about paperwork and job hunting. Anyway, no shots or vaccines of any kind are required, except you may want to be up to date of your normal ones, such as Tetanus. While here, I watched Contagion. I don't recommend watching this movie if you are planning to travel soon. If you do, I may as well tell you to stock up on PocketBac Anti-bacterial hand gel from Bath and Body Works! I brought 20 with me for Chelsea, but I confess I swiped one for myself after watching that movie. As far as flights go, I am extremely cheap. So, I actually bought my ticket back in July when I knew Chelsea was leaving, but she hadn't even gotten her ticket yet! Boy, do I think ahead. I used one of the cheap tickets type websites to find and purchase the ticket. There are quite a few: try Kayak.com or CheapSeats.com. I'm no expert, but I do know how to use Google! The ticket cost all together about $1100 (Houston to Seoul) including flight insurance (if I had an emergency and had to cancel I guess - it sounded good, anyway). I planned to come during the Thanksgiving Break (since I work at a college) but after thinking about it, if I left the Wednesday before Thanksgiving, I would get here Thursday night, and we'd have Friday (before she went to work) Sat, Sun, and then I thought I'd leave on Monday so I wouldn't miss much work. Turns out THAT IS NOT ENOUGH TIME TO VISIT YOUR ONLY CHILD ON THE OTHER SIDE OF THE WORLD. Who knew? I extended my visit to 10 days and it has been great, but it's still not enough time. The flight here lasted about 20 hours. I left at 10 am on Tuesday and got here 9 pm Wednesday. Weird math in action because you count flight time, and plus the time is 15 hours ahead of Houston here. My return flight will be leaving Thursday 6 pm and arriving at Houston at 8 pm! Also, bring your debit card with you and make a withdrawal at a bank. I did this once and there was a small fee, then again at a different bank and there was not a fee. I used the ATM both times. Look for one that says Global Services or something like that. Surprisingly, the fee was at a Citi Bank ATM but at the Korean Bank (KBStar) there wasn't any fee! So, lesson learned: go local. Make sure to pack comfy shoes. There is a lot of walking and stair climbing here, and that's a good thing for your body. Don't pack too many shoes. Clothes? 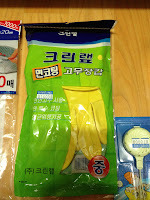 Pack pretty lightly, you can do laundry in your kid's "Officetel" (Korea-speak for trailer-sized room with one window). That is, if you can figure out which is the laundry soap and which is the softener. 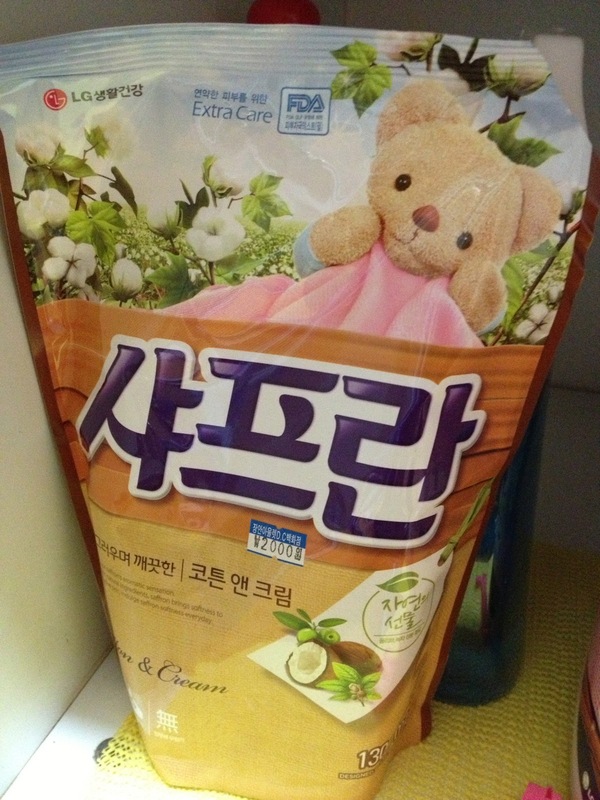 The fluffy bear on the package helped a lot. Use a lot of softener because items must be hang dried. 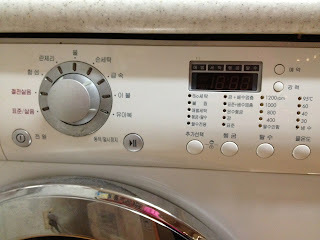 Clothes washer instruction panel. Translation, anyone? Expect your kid's (or friend's) room to be kind of dirty. By this I mean, your kid inherited a room from the previous teacher. Do you think that teacher wanted to thoroughly clean the room before moving out? Heck no! They packed and beat it to the airport! And your kid will not give it the Mother-approved cleaning it should get because she doesn't want to clean someone else's dirt. So, in the bathroom, expect dirt in the grout and mold on the rubber stuff around the edges. I tackled it with bleach and a brush, twice, but that didn't touch it. I cleaned the sink, toilet, etc., as best I could, and just let it go. I'm not even going to mention the "kitchen" which is a counter with a sink and a double (gas) hotplate. Got it clean too. Had better luck due to no mold. The rest of the room is pretty easy to clean with a swiffer which is available here. A lot of things are available here, but you will have to decipher what it means by looking at the picture on the package. Sometimes, there may be an English word! For instance, "Dish Cloth" or "Drain Net" or "Woven Duster." 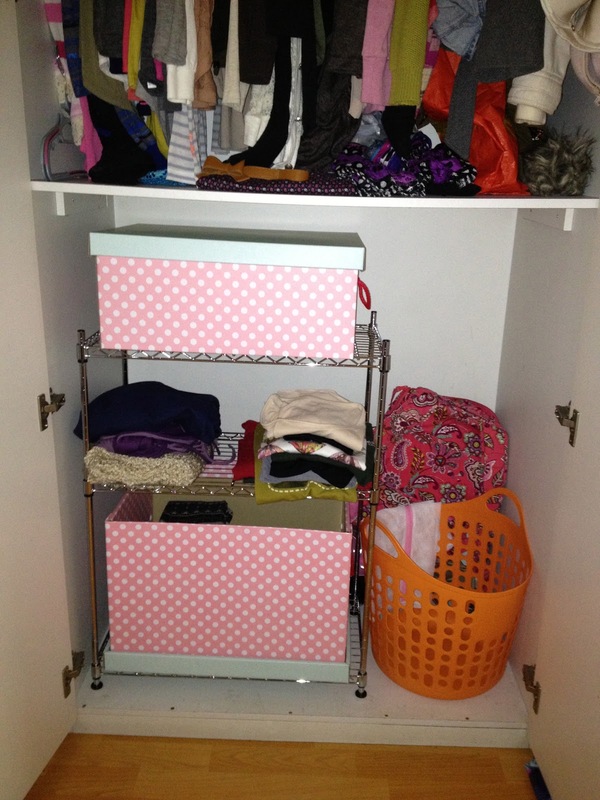 Make sure to neither send nor bring anything that will clutter up a flat surface! That space is just too dear. Instead, I would recommend supplying shower gel and a loofa for them to use. Chelsea has to use Dove bar soap and she prefers not to, but can't find any shower gel. When I got here, I could see the bottom of her wardrobe was not being used wisely, with a huge suitcase and some backpacks in the bottom half. We went to Home Plus (sort of like Target or Marks and Spencers for you Brits) and got a wire shelving unit and put it in there. I bought a couple of boxes to put on the shelves so she can store her clothing. I think she needs one more, but that will wait till she goes shopping there again. Oh, Kleenex, real, brand-name Kleenex! It is so dry here, and my nose has suffered greatly. The facial tissue here is not quite soft enough and if you hit me lightly in the nose right now, it would hurt like heck and bleed like crazy! Not that I want anyone to hit me in the nose. Travel here is pretty easy. Walk to closer destinations, catch the bus to things that are a little farther away, and take the subway for more distant destinations. We went to the Dongdaemun Night Market last night and hopped on the correct bus to return home... on the incorrect side of the street. For 35 minutes, we "followed" our bus driver driving farther and farther from the apartment. Then the bus driver (who drove herky-jerky, stepping on it and slamming on the brakes every single stop) had to take a smoke break outside for a few minutes, then he got back in the bus (we were the only fools left on the bus) and headed BACK TO WHERE WE STARTED... we just hung in there. Stubborn I suppose, but now we know that on this route, it takes over an hour for the driver to make his appointed rounds. As we rode, if there were no waiting people and no one wanting off the bus, the driver would open/close the doors as he flew by the bus stop! We finally made it home at midnight. We had gotten on the bus at 10:55pm. In that case, the subway would have been a much wiser choice. 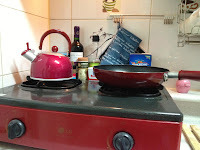 As far as food goes, if you read my previous blog, you will know I am not a fan. But, yesterday, I tried Kimbop, which is like sushi, but no fish. I know I'm not using the word, Sushi, correctly, but Kimbop is a seaweed wrapper, rice, then ham strips, a yellow fruit/veg I'm not sure what that is, and it's rolled up and sliced like I've seen at Sushi places. Whatever that's called. I ate it. I liked it. I did not die or have my mouth burnt to a crisp. If you want more familiar and/or Western food, it is possible to find it, but it could be more expensive than you're used to. Depends on what you are used to. The Kimbop was about $2. 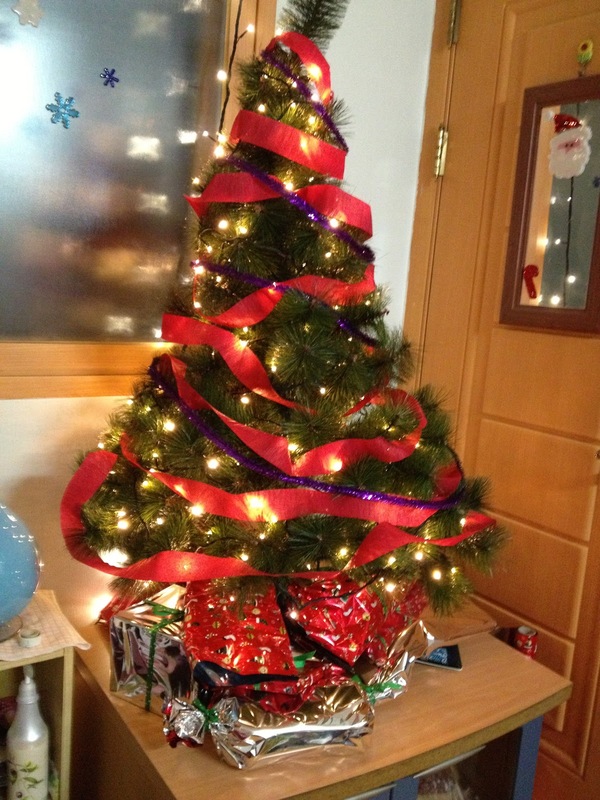 Christmas tree adds holiday cheer! So tomorrow I leave. I've pretty much got my bags packed. Here is one last tip if you are a parent: Bring a suitcase that can fit inside a larger suitcase. That way you can pack all the goodies, clothes, boots, food items, Christmas gifts, special Tweezerman tweezers, everything, into one suitcase, your other can have your stuff, and when you leave, you only have to take back one bag (because the smaller one is now inside the larger one). ... well, unless you filled the larger one with stuff to take home! There is lots more to tell, but I'll let you discover it yourself! Don't be afraid to come and visit! It's a very "cool" experience! PS: a special shout out to my mom! I haven't even emailed her on this trip, I hope the blog helps. I'll call you when I land in San Francisco tomorrow (actually the day after tomorrow for you). Love you! I call it like I see it! Lol just kidding sweetie! You've done great! Chelsea you are SO FUNNY! No kidding - you cleaned madly and it was a great job! I can't see you leaving ANY PLACE in the condition you found it! Your mom has done beautifully with her description of dos & don'ts for any visitor. The Christmas tree is lovely. I wondered about a Charlie Brown Tree, but this one is more like it!! Very pretty and festive. Oh I hope your mom can actually sleep on her flight back to America. Your visitors will make your time fly . . . Congratulations on showing your mom around Seoul; I have no doubt she enjoyed it. Except for the food! And maybe the many stairs . . . Awaiting your next blog!